Different people have different views about what may constitute decisive moments. These include the following. You make a crucial decision that has consequences – both for you and other people. You manage a crisis, tackle a specific challenge or make the most of an opportunity. You have a Eureka Moment when you see things clearly and then translate into action what you learned from the experience. You make ongoing decisions in your daily life and the way you translate these into action has consequences – both for yourself and other people. 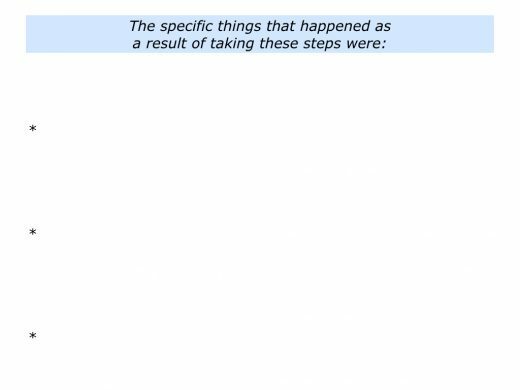 Looking back, when have you taken some of these steps? 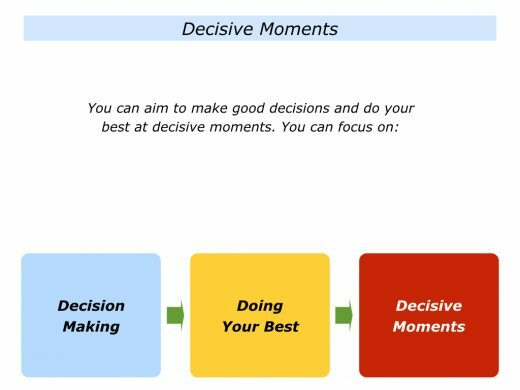 Can you think of a situation when you focused on making a decision and then doing your best at a decisive moment? You may have been making a decision about your health, a career change or a transition. You may have been helping your child deal with problems, making redundancies or managing a difficult boss. You may have been counselling a suicidal person, dealing with casualties after an accident or tackling another challenge. What did you do then to make the decision? What did you do to clarify the real results to achieve? 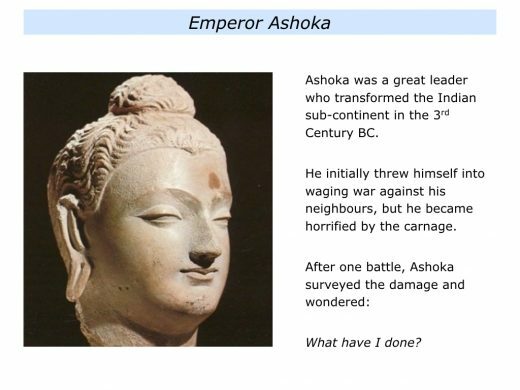 What did you do to explore the possible ways forwards and the consequences of each option? What did you do to settle on your chosen strategy? What did you to pursue your chosen route? What did you do to encourage yourself on the journey? What did you do to do your best to achieve the picture of success? Describe a specific situation in the past when you focused on making a decision and doing your best at a decisive moment. Some people say that decisive moments can be overrated. They believe that we make many small decisions that are translated into habits that shape our futures. 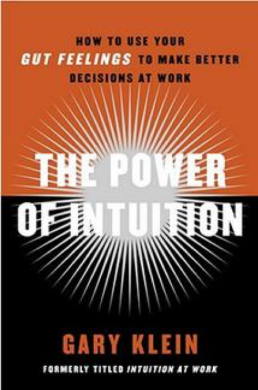 Other people say the decisions we make at decisive moments have a profound effect on our lives. Leo Fernandez, the co-founder of TalentEase, emphasised this point in an article he wrote for Linked In. 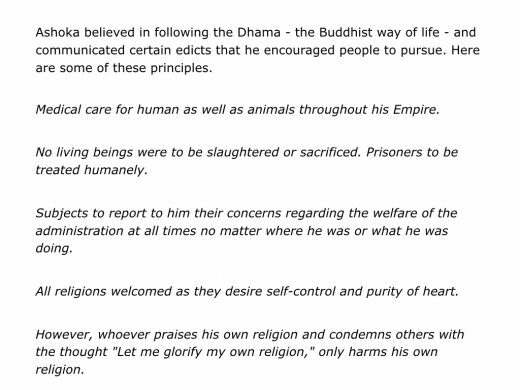 Below are excerpts from the article. You can discover more via the following links to the article and the TalentEase website. We spend 90% of our time on the ‘straight roads’ of life but often it is the 10% of the time we spend making the ‘turns’ that defines where we end up. These are the decisive moments- of work and life. How do we harness these moments better? The term decisive moment was coined by the French photographer Henri Cartier-Bresson. He used it to describe that fraction of a second when a photographer is able to capture the magic of the person or event he is photographing. As he put it to the Washington Post in 1957; “There is a creative fraction of a second when you are taking a picture. “Your eye must see a composition or an expression that life itself offers you, and you must know with intuition when to click the camera. That decisive moment makes the difference between a good picture and a great one. It is also true of life. Each of us faces decisive moments, when we have to make critical choices in our lives. 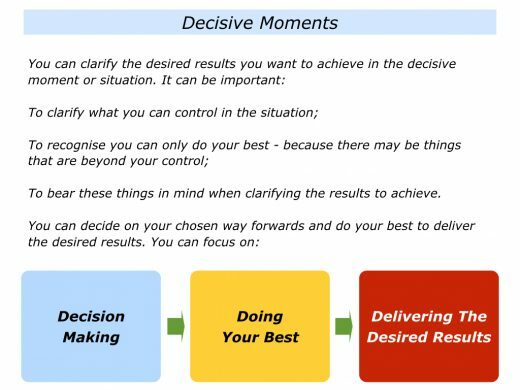 For many of us, business students and business managers beginning our careers our decisive moments are happening right now. Are we being watchful for them? Do we recognize them? And more important do we grasp the moment and act on it? As veterans will tell you, when you near the sunset of your life, your regrets are not the things you did, but often the things you didn’t. So let’s pledge to recognize and seize those decisive moments in our lives. They rarely come calling again. Different people use different models for doing their best at decisive moments. The following sections look at some of these approaches. 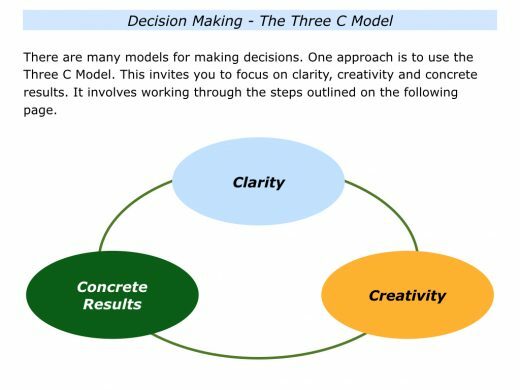 One approach is to use the Three C model. This involves focusing on clarity, creative and concrete results. 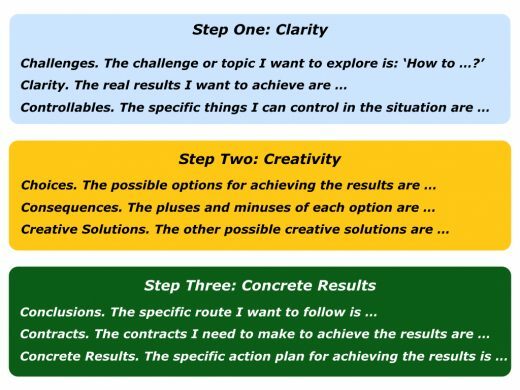 Imagine that you want to use this model when deciding how to tackle a challenge. This involves going through the following steps. Bearing this in mind, you may want to work through some of the following questions. What is the challenge I want to tackle? For example: How to …? Looking at this challenge, what are the real results I want to achieve? What is the picture of success? What are the things I can control in the situation? What is the option – or combination of options – I want to follow? How can I translate this into a clear action plan? Are there any contracts I need to make with other people to make this happen? How can I get some early successes? What else can I do to increase the chances of success? Great athletes often need to perform when under pressure. Some coaches therefore provide the athletes with models they can use to stay calm at critical moments. James Kerr describes one model for making this happen in his book Legacy, which is about the New Zealand All Blacks rugby team. Being an All Black is a great honour, but it also comes with responsibilities. The players are expected to inspire the nation and win every match. Looking at the team’s history, this has sometimes led to the players having negative emotions and failing to deliver the goods. This has been exemplified by them making poor decisions in critical situations. James describes how the players learned to feel calm rather than frantic in such situations. They switched to a state they called Blue Head rather than Red Head. Here is an overview of the two states. Daniel Coyle, author of The Talent Code, summarised this approach in one of his blogs. 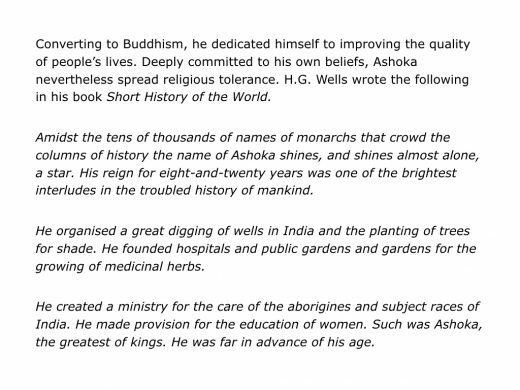 Below are excerpts from the piece that you can find via the following link. Quick background: a few years ago, the team was going through a period of uncharacteristic struggle. Some players were having trouble controlling their emotions in matches. So, with the help of a former Rhodes Scholar named Ceri Evans, they devised a tool to fix that, built on a simple two-part frame that describes the mental state you want to avoid, and the one you want to be in. They call it Red Head/Blue Head. 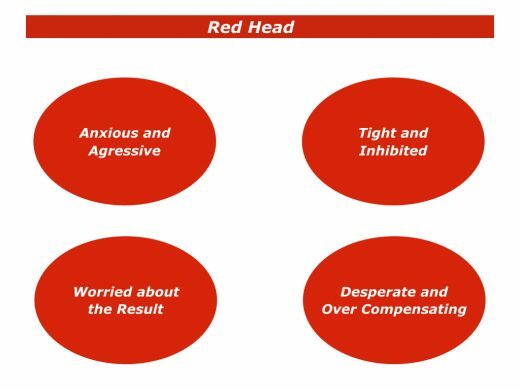 Red Head is the negative state, when you are heated, overwhelmed, and tense (H.O.T., in the parlance). Your emotional engine is smoking, your perceptions are slow, the game feels too fast, and your decision making is rushed. 1) Seek to stay in Blue Head as your default setting. 3) Use a physical or mental trigger to get yourself back into Blue Head. On the All Blacks, each player is encouraged to devise personal triggers to make the transition. One player stamps his feet into the grass, to ground himself. Another uses mental imagery, picturing himself from the highest seat in the stadium, to help put the moment in perspective. Whatever tool you use doesn’t matter – what matters is realizing you’re in the wrong emotional zone, and finding ways to cool yourself off and get back in a high-performing head space. 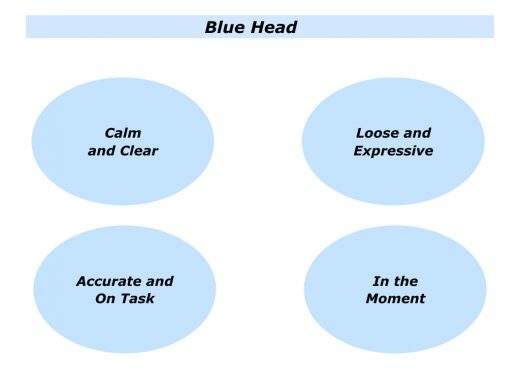 A person who puts on their Blue Head is more likely to think clearly under pressure. They can then use their chosen model for making good decisions and perform at their best. Some people seem to be able to make good decisions on the spot. One explanation for this is that they use strategic intuition. Let’s explore several ways that people may apply this ability. 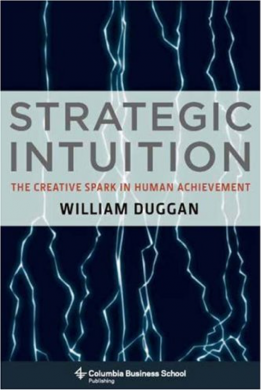 William Duggan, who wrote Strategic Intuition, believes there are three kinds of strategic ideas that apply to human achievement. He describes these in the following way. The best description comes from an early classic of military strategy, On War by Carl von Clausewitz. Clausewitz gives us four steps. Bill Breen has written an excellent article on Gary’s work in The Fast Company magazine. You can find it at the following link. Let’s return to your own life and work. 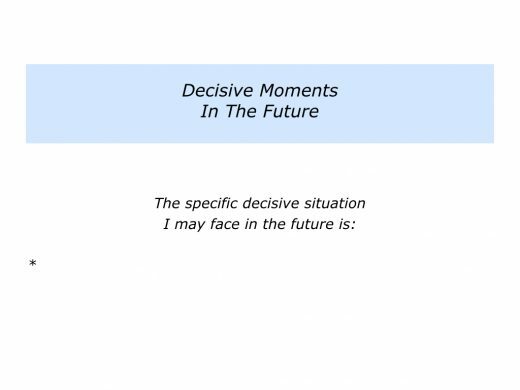 Looking ahead, can you think of a decisive moment – or a decisive situation – you may face in the future? You may aim to make a transition, go for a job interview or help your child overcome a specific challenge. You may aim to revamp your team, hold a difficult conversation with your boss or make a presentation to your venture capitalist. You may aim to finish a project, take a break and then develop a new sense of purpose. You may aim to deal with a specific crisis, manage a health challenge or embark on tackling a new venture. Imagine that you have chosen to focus on a specific decisive moment or situation. It can be useful to go through the following steps. Imagine that you are looking ahead to the decisive moment or situation. Here are some themes you may wish to explore. These can help to clarify the desired results. What is the specific situation in which I want to do my best? What are the real results I want to achieve? 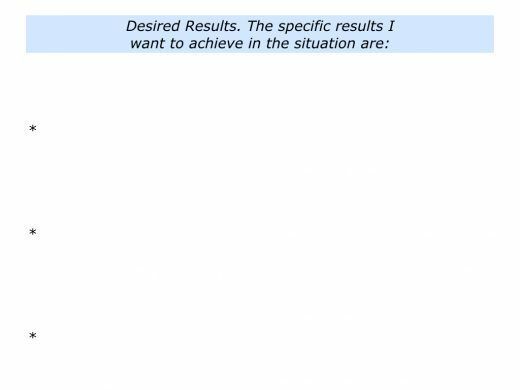 If there are several results I want to achieve, what are these in order of priority? What is the picture of success? What are the things I can control in the situation? What are the things I can’t control? How can I build on what I can control and manage what I can’t control? Bearing in mind the answers to these questions, here is the picture of success. Imagine you are clear on your goals. The next step is to clarify how you can do your best to achieve these aims. You may therefore wish to explore the following themes. What are the possible options – together with the consequences of each option – for working towards achieving the picture of success? Are there any other possible ways forwards? What are the best parts of each option? Can I put these together into another possible option? What is the option – or combination of options – that I want to pursue? What are the pluses of this option? What are the minuses? How can I build on the pluses and minimise the minuses? What are the potential problems I may meet on the way? How can I prevent some of these problems happening? How can I manage these problems if, despite my best efforts, they do happen? 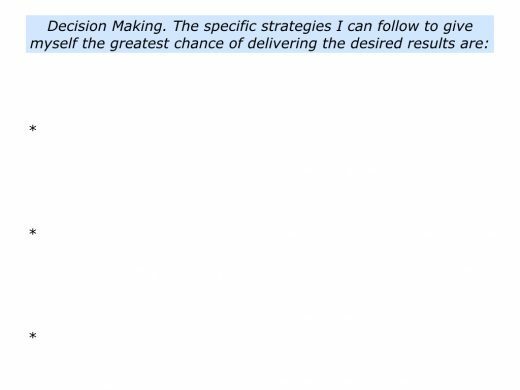 Looking at my preferred option, what are the key strategies I can follow to give myself the greatest chance of success? How can I translate these into a specific action plan? How can I get a quick success? How can I encourage myself on the journey? What else can I do to increase the chances of achieving the picture of success? Imagine that you have decided how to move forward. It will then be time to swing into action. Here are some themes you may wish to consider when taking these steps. How can I prepare properly before moving into action? How can I organise my time properly – such as organising it in blocks? How can I rehearse what I am going to do? How can I then follow my chosen rhythm and get the desired results? How can I click into action and be fully present? How can I pursue my chosen strategies? How can I deliver the required professional standards? How can I do reality checks about: a) What is working; b) What I can do better and how? How can I deal with potential problems? How can I buy time to think when faced by crises? How can I find solutions by focusing on clarity, creativity and concrete results? How can I keep doing the basics and then add the brilliance? How can I focus on constant improvement? How can I do my best to achieve the goals? How can I then add that touch of class? Different people choose different ways to do their best during decisive moments. Some choose to conduct themselves in a caring way. Let’s look at one person who chose to take this path. Let’s return to your own life and work. Looking ahead, can you think of a decisive moment or situation you may face in the future? How can you then do your best to make good decisions and deliver the desired results? If you wish, try tackling the exercise on this theme. 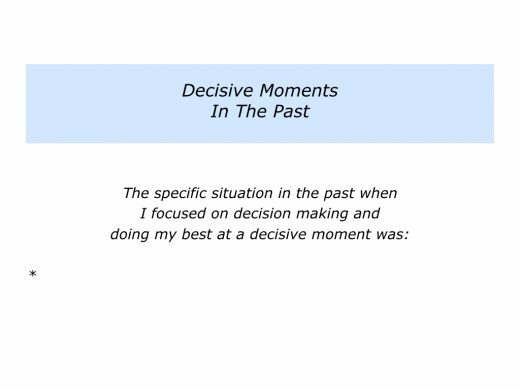 This invites you to start by describing a specific decisive situation you may face in the future. It then invites you to do the following things. Describe the specific desired results you want to achieve in the situation. Describe the specific strategies you can follow to give yourself the greatest chance of success. 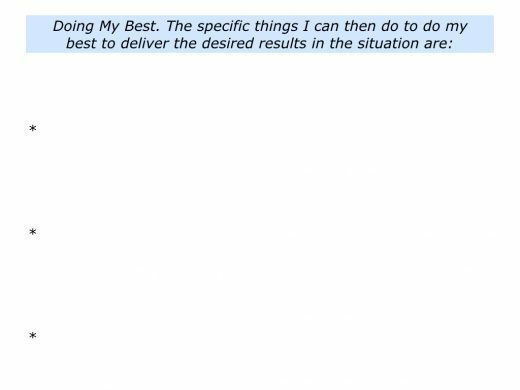 Describe the specific things you can do to do your best to deliver the desired results.